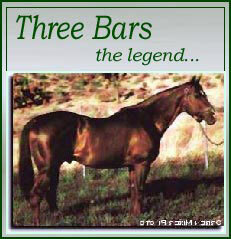 Three Bars was a Thoroughbred stallion who impacted many breeds: AQHA, APHA, ApHC and other equine registries. The Three Bars Web Ring will help equine breeders of this bloodline join together to sing the praises of the Three Bars athletes in their breeding programs. Whether you have Appaloosas, Quarter Horses or Paints, consider joining this ring and show off the Three Bars in YOUR barn, to the rest of the world.